Joey McIntyre, Danny Wood, Jordan Knight, Jonathan Knight and Donnie Wahlberg of New Kids on the Block perform at Manchester Apollo on May 30 in Manchester, United Kingdom. We’re exploring data from The Echo Nest and Song Meanings about boy bands from the 1990s. Check out our explainer of how the data set works, along with an analysis of boy bands’ composition and lifespan. On Wednesday, we looked at the laughably old ages of their members (we did so without a single Boyz II Men pun — we’re models of restraint). This installment looks at what made ’90s boy bands distinct, or completely indistinct, musically. Nope. Boy bands, musically speaking, are as vanilla as it gets. And boy bands in the ’90s were in the mainstream of the mainstream. We can prove this by using The Echo Nest, which quantifies all sorts of things, such as how acoustic or produced a song is and how loud it is, as well as assessing attributes like energy, danceability and happiness. The boy bands of the ’90s largely complied with the general musical tone set by contemporaneous pop: danceable, upbeat and up-tempo. 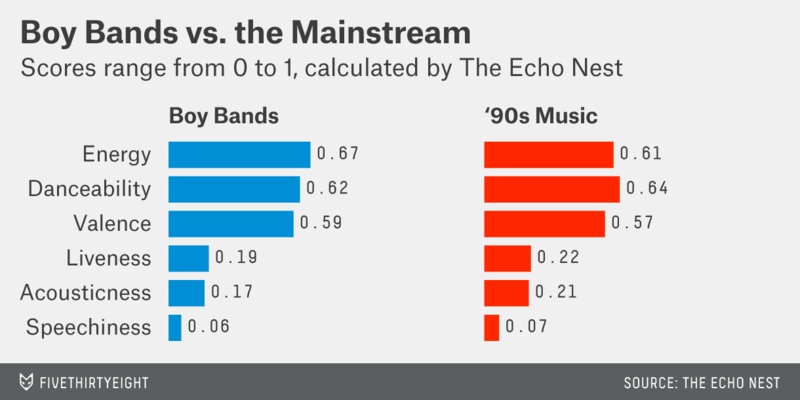 There was only one main distinction: Boy band music was typically higher-energy. I pulled the 25 most popular songs (see note below) from each of the 36 boy bands in our data set. After removing obvious duplicates, I was left with 651 songs. Not all of these songs were released in the 1990s — The Echo Nest doesn’t publish album data, so it’s remarkably difficult to find release dates for individual songs — but all of them were released by bands that were ’90s boy bands. To find where ’90s boy band music truly separated itself, though, we look to its energy level. Energy seeks to quantify how fast, loud and noisy a song is. It’s derived from things like how long segments of the song last, as well as timbre and dynamic range (the difference between the softest and loudest notes). Music from the boy band set has a higher average energy level (0.68) than the generic ’90s set (0.61). For example,“MMM bop” by Hanson has high energy (0.93). It is bouncy, has a strong beat, and is fast and noisy with a wide dynamic range. So, in news I’m sure will shock the musical community, I found that ’90s boy bands were all in all not super innovative with their sound, and that they were characterized by high energy beats. I’ll be waiting for my Pulitzer. Note: The Echo Nest’s popularity metric is an interesting black box. The value — hotttnesss (sic) — goes from zero to 1, where zero is nobody at all is listening and 1 is whatever Taylor Swift song owns the charts at the moment. One of The Echo Nest’s primary businesses is selling its song-recommendation engine services, so the hotttnesss metric is a bit of secret sauce. We don’t know precisely how it’s calculated, and it changes over time as songs go in and out of style. Given that The Echo Nest is owned by Spotify — a company with a significant financial interest in maintaining the secrecy of its raw numbers — and rest of the data is so great, we were willing to accept a little bit of mystery. A comparison of the metric and the ranking of songs by popularity on music-streaming sites left me confident in its reliability.